Long before I was born my maternal grandfather (known to me as Ah Con in Teochew) hand-made and sold different types of pickles and fermented fish for a short period in his life. It was short lived because he made no profits according to Ah Ma (grandmother). She said it was a lot of work and the return was little to none. I am glad to hear he knew enough to stop this business early! I did not know he made these items until this trip. I visited him a handful of times between 1996 until 2007 (when he passed away in his sleep at the age of 89). Back then the topic of pickling never came up. I knew he was a man of many talents; successful farmer and businessman back in the day. I guess he did not want to dwell on his unsuccessful attempts or perhaps it was long forgotten. Ah Con spoke fluent Vietnamese, Teochew and Khmer. He was much loved and respected by those who knew him. Pretty much everyone in the village knew him. To me he was larger than life itself. He was kind and helpful to all people and he never spoke any unkind word about anyone. I remember him always happy and appeared stress-free. He rarely let anything bother him. Perhaps this may be a reason that at 89 he barely had gray hair. Ah Con had a morning ritual. He got up at dawn and headed over to one of the local coffee shops to meet his friends. He would share with his friends the world news that he heard from the BBC radio station the previous day. 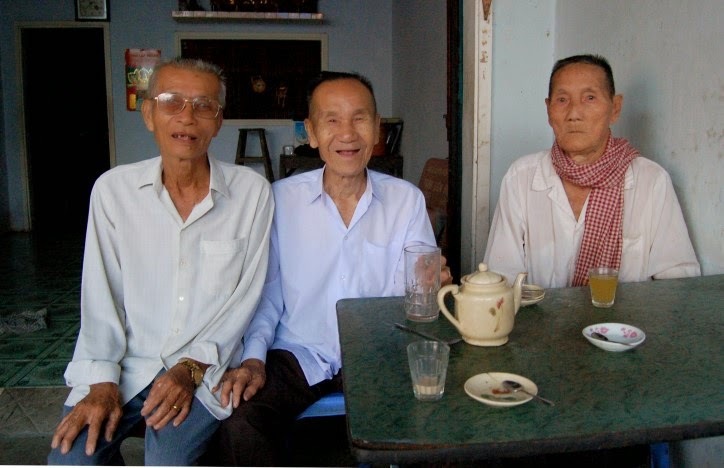 On one of my trips I woke up early just to spy my grandfather and his remaining two friends enjoying their usual morning routine. That was 2007 and that same year all three passed away. My grandfather was the first to go. When I was a very young girl living in Vietnam I remember he planted cassava in beautiful rows in back of my home. When I visited him later as an adult he continued to plant basically anything and everything. 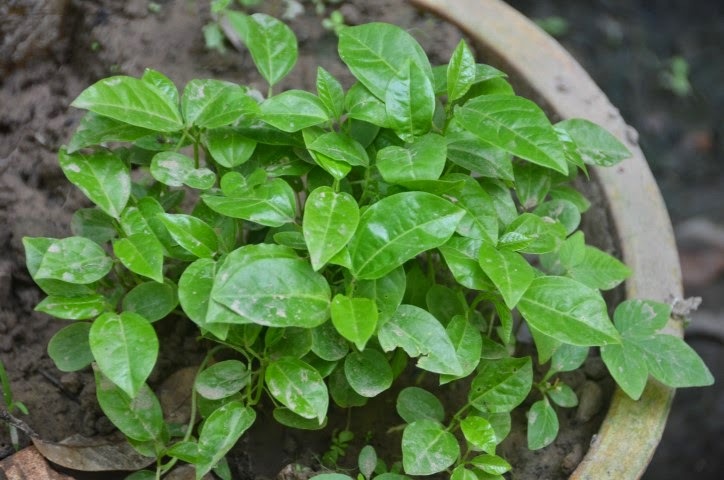 One time I helped out in the kitchen by cleaning the herbs brought back from the market and I mentioned to him that we could probably take the roots that I cut off and plant them. When I came back later those roots were already planted in the ground outside! My mother also has many fond memories of her father. Recently she mentioned that he frequently took her by bicycle when she was a young girl, seated in the back as he peddled her to the field (farm), singing to her to keep her awake. She said he used to work side by side with his staff out in the field doing the same rigorous manual labor. Later when she was old enough to peddle a bike she would bring food and drinks for everyone working hard out in the field in the tropical heat. in memory of my late Ah Con (grandfather). 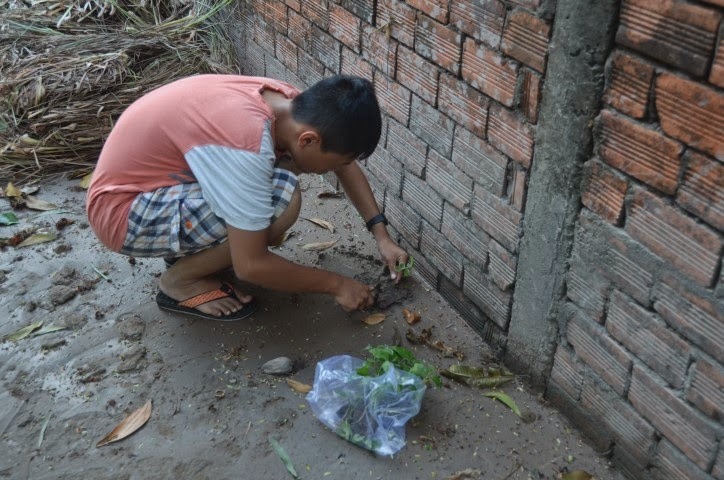 addendum: While in Vietnam I advocate for home gardening. in his grandparents' (my aunt and uncle's) back yard. Coincidentally my maternal eldest aunt (Tua Y) from Minnesota and I are visiting Ah Ma and other relatives (in Vietnam) about the same time. 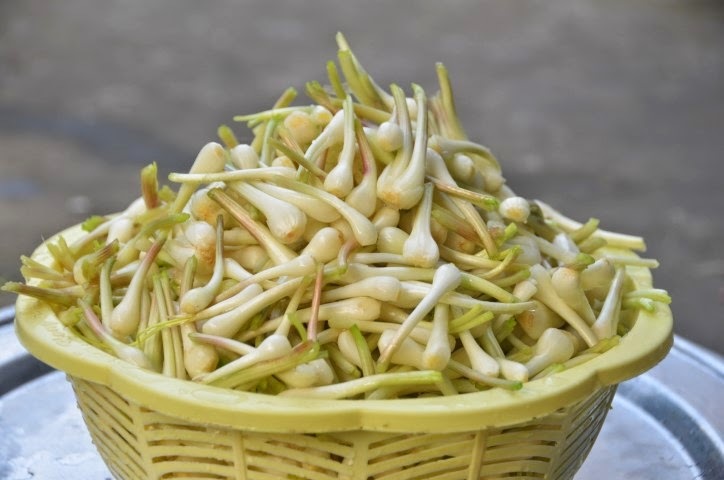 She shared with me that Ah Con self pickled a popular type of Chinese onions known as củ kiệu in Vietnamese. These special onions are only available near the Lunar New Year (or Tet). 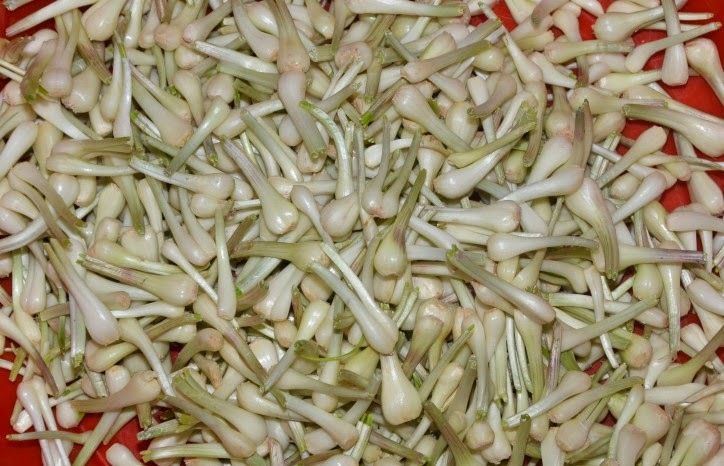 Only the white part located at the base is used for pickling. Tua Y said she continues to follow the same technique that she saw Ah Con use many years ago. As typical in my family Tua Y does not have any written recipe. She verbally told me the process but vaguely and without even any hint of measurement. I was hoping for a handful of salt or something of this nature. For example I asked her how much salt should I use. She responded with "just enough so you can taste it". 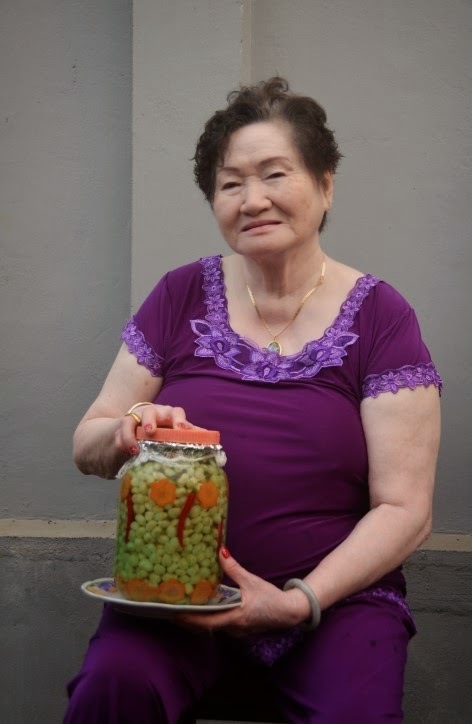 Luckily she came over a few times to visit my grandmother during my pickling experiment so I had her taste the salty water and the vinegar/sugar liquid for approval. Somehow I lucked out by using just the right amount of ingredients for most of this recipe. Here is finally a written recipe that has been around for probably over a 100 years in my family! 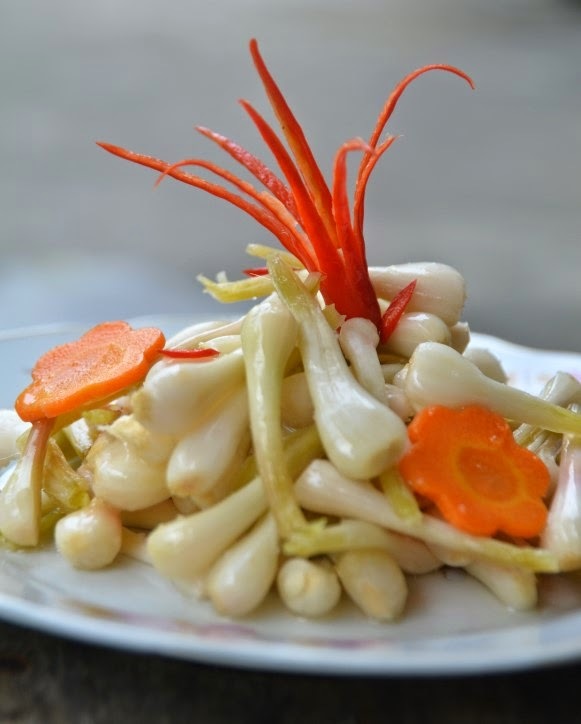 These củ kiệu are crunchy with some tartness. If you prefer more sweetness you may add a little sugar prior to eating or more sugar to the vinegar/sugar solution. I am not too fond of anything overly sweet so I find this recipe to be OK for my taste. 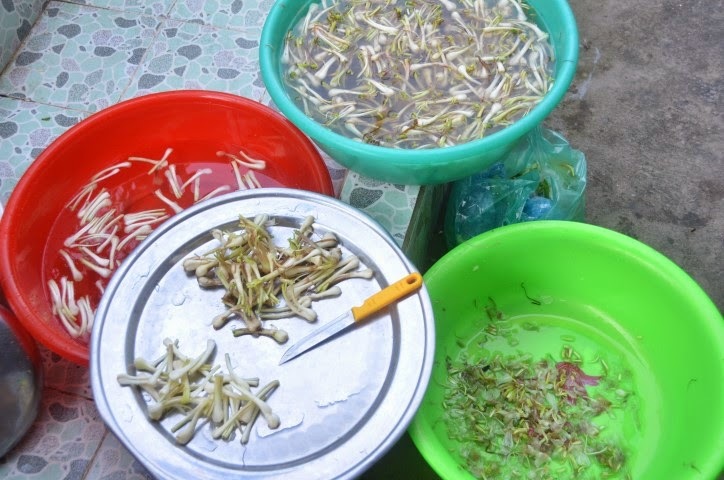 1) While soaking the củ kiệu (Chinese onion), take each one and remove any tough outer layers. 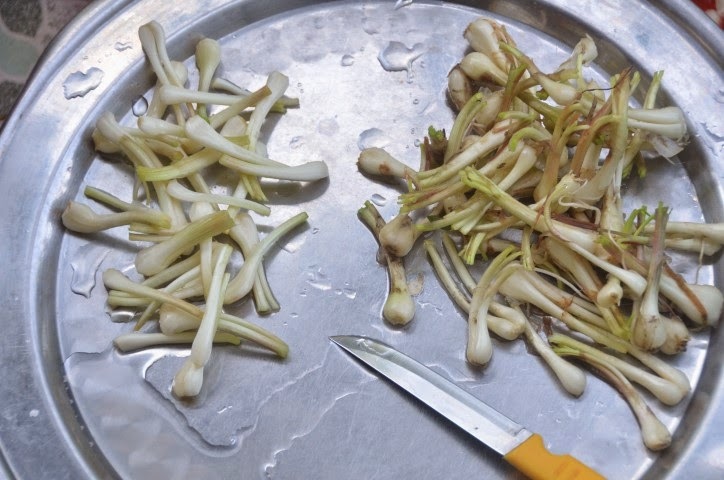 Trim off any roots and green parts. Each white part of the onion will be about 1 1/2 to 2-inch length. Avoid over-trimming as this is possible (according to my aunt). If you cut off too much of the root then the onion will not be as crunchy later. Wash until the onion is completely clean and white. 2) Once cleaned, drain and spread the onions in a single layer in a pan or platter. Let them sun dry for 1/2 to 1 day or until the onions are dried and slightly wilted. 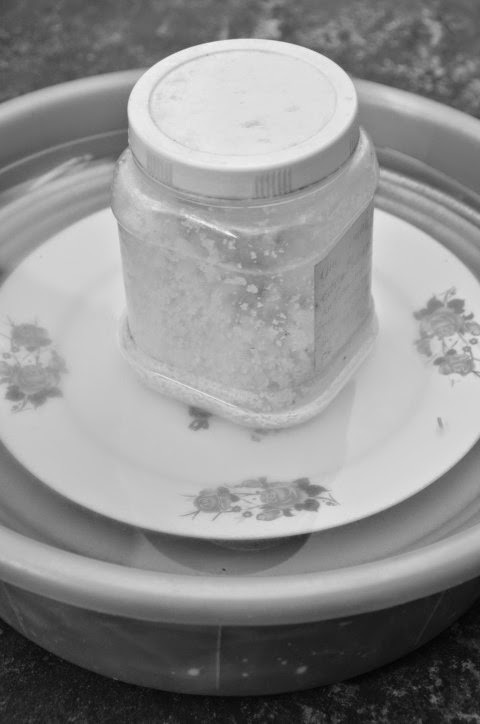 3) To make the salty water (this cannot be too salty per my aunt): Add 1 gallon and 12 ounces water in a large pot. Once the water starts to boil turn heat down slightly and add 1/2 cup sea salt. Stir occasionally and once the salt has dissolved, remove from heat and let the liquid cool completely. 4) In a clean large container pour in the cooled salted water and add the wilted onions. Use a plate to push down the onions so they are all submerged in the salty liquid. Put something heavy on top to keep the plate in the water. Keep the onions in salty water for 2-3 nights. 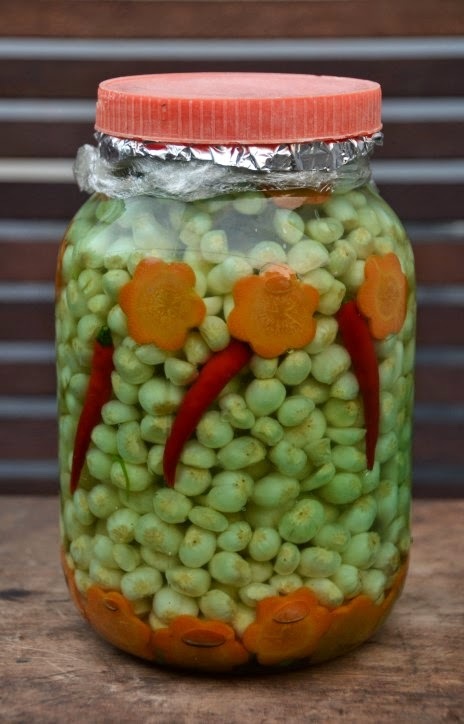 You may do a taste test after 2 nights to see if they are ready for pickling by biting into one and tasting it. When the onion is ready then it should not taste raw or has a strong peppery taste. If they are not ready then leave for another night. 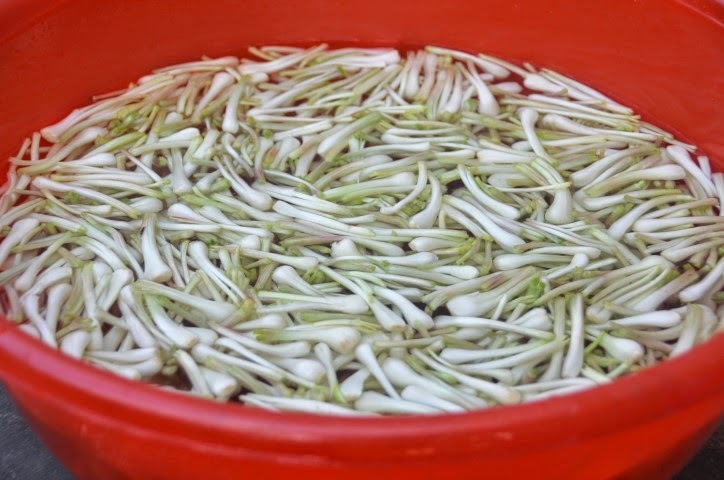 5) To make the final pickling solution (may make this 1 day ahead and let cool completely before using): Cook 6 cups of vinegar (preferably home-made or vinegar from Thailand) and 1 1/3 cups sugar in water. Once the water starts to boil turn heat down to low. Stir until the sugar has dissolved and remove from heat. Let cool completely. 6) Put the onions in sterilized jars and pour the cooled liquid over them. Keep the jars at room temperature until ready to eat. May try one in 1 week and if it tastes sweet, sour and not raw then it is ready. You may refrigerate these after 2 weeks. 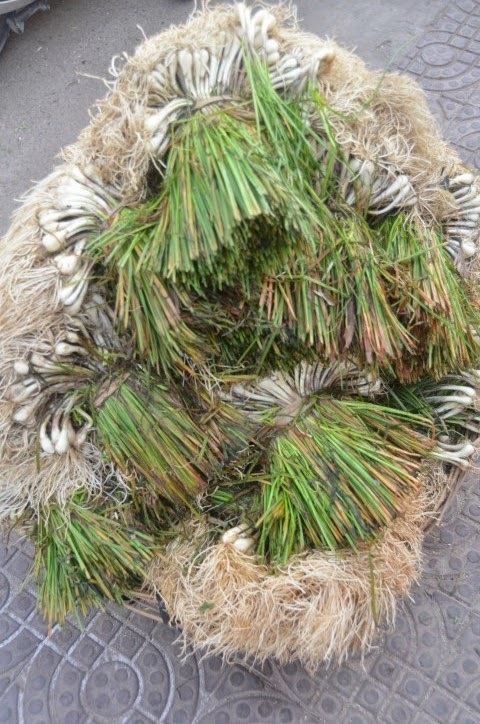 *It is best and less time consuming to buy these Chinese onions with most of the roots and green parts cut off. This way you will have less work and you get more onions out of what you purchased. *You may add whole chili peppers and sliced carrot for a nicer presentation. If you are using sliced carrots you will need to dry them in the sun for 1/2 day or until they are not moist anymore. My aunt at age 76 y.o. 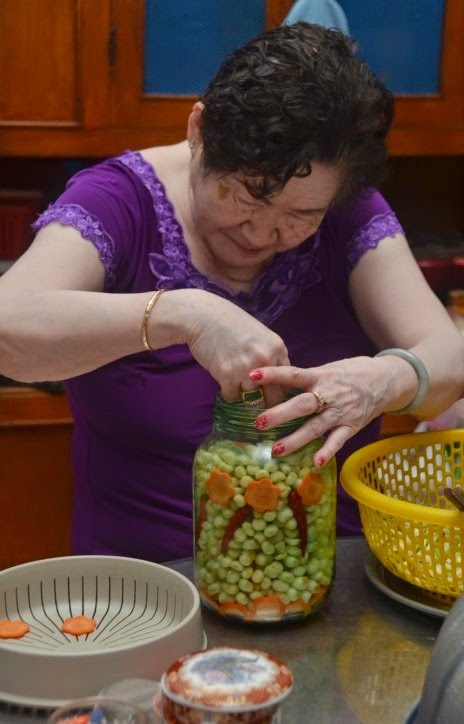 (she insists she is now 76 since end of the year everyone in my Chinese family gained 1 year no matter the birth date) still has the energy to stack the onions, peppers and carrots neatly in a jar (see photo below)--a very tiring and tedious process! Definitely you do this for your own enjoyment and not for selling! *Try to save any glass jars you have for pickling. I prefer the smaller ones for easy access and for gifting. Unfortunately I don't have access to the best looking jars here. However, make sure the jars and lids are cleaned and sterilized in boiling water before using. *After cleaning and drying the onions they will reduce in size. I bought 5 pounds of onions from the market and after cleaning and drying they came to about 3.2 pounds. 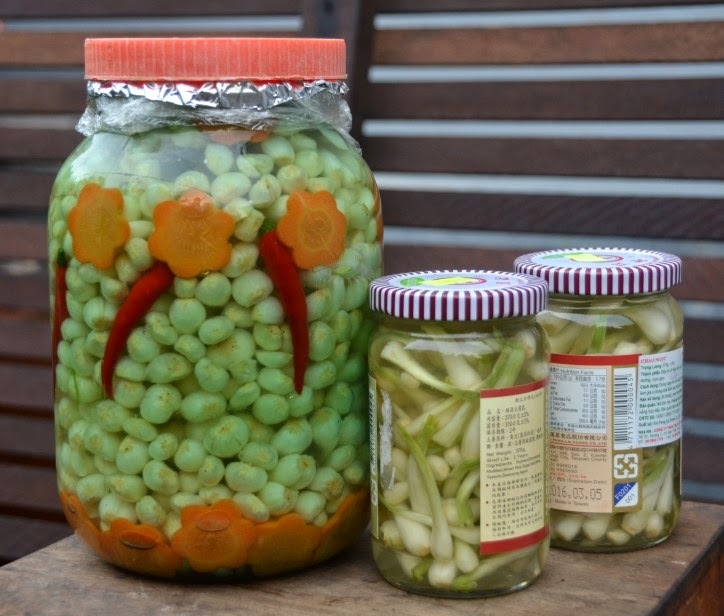 **After 4 days of pickling these tasted quite delicious and basically ready to eat. There is almost no spiciness when you bite into it. This recipe is not as sweet as what most of my relatives prefer. If you do not want it this tart then add 1 2/3 cups to 2 cups of sugar for this recipe. You can adjust the sugar little by little to the vinegar until it is according to your taste. *With this recipe my aunts recommend adding a large pinch of sugar to about a handful of onions prior to eating. This way they will not be so tart. 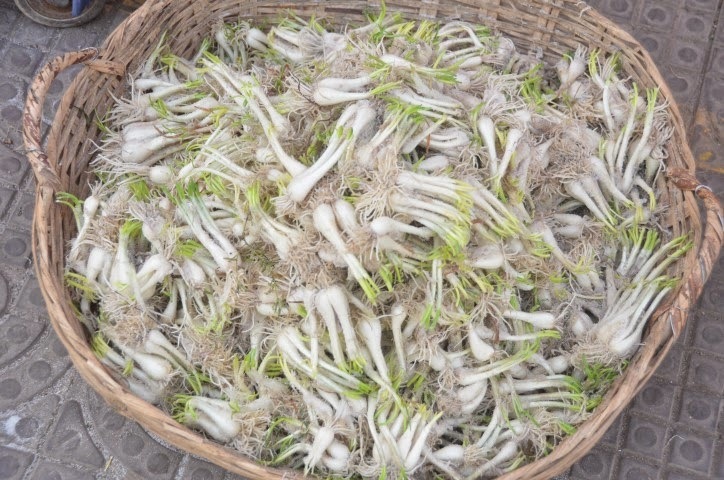 *Click on this link to read more about củ kiệu or Allium chinense. to help balance the tartness with some sweetness. You can also add dried shrimp to this if interested. I like to garnish with a chili pepper. *To my viewers I apologize if my spacing in some of these postings do not look right. I try my best to make it look ok prior to publishing but they don't always look as good as I like.